The Magic is Back! A Los Angeles Family Holiday Tradition since 1973, Westside Ballet proudly presents eight performances at The Broad Stage in Santa Monica beginning Thanksgiving Weekend. Our performances always sell out, so we encourage you to buy early! 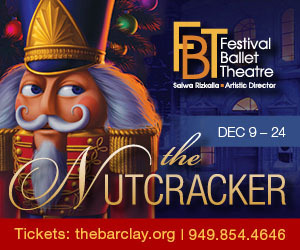 Get your tickets now to the longest running NUTCRACKER production in Los Angeles. Take a trip with Clara to a magical world of dancing snowflakes, Spanish chocolate, and a dashing prince. 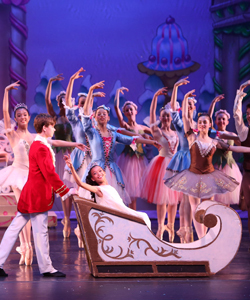 From the Victorian-style party scene to the glittering Sugar Plum Fairy, it's the traditional full-length ballet in two acts set to Tchaikovsky's majestic score as performed live by the Santa Monica Symphony Orchestra. The artistic interpretation captures the spirit of choreographer George Balanchine, as passed on by Westside's founder Yvonne Mounsey, who created the Nutcracker role of Center Spanish during the peak of her career as principal dancer with New York City Ballet. Kids 2 and under sit on Mom's lap for free! This will be Westside Ballet's fifth year at the Santa Monica College Performing Arts Center to a LIVE ORCHESTRA! Special Group Rates Available for Groups of 15 or More.